Rotherham Hockey Club would like to extend its sincere thanks to the many individuals and clubs throughout Yorkshire and beyond who have so graciously offered their support. The many postings of encouragement and comfort offered to Chris Parke and his family has been quite incredible. Chris and his parents have asked that we thank everyone for all the kind messages of support and good wishes at this difficult time. Chris suffered a major neck injury in a most unfortunate accident and has been hospitalised since this incident some 15 weeks ago. He is currently making steady, but slow progress, with very limited movement above his waist. Now that he is off the ventilator, Chris is able to talk, albeit with some difficulty and is now able to eat solid food. 21 year old Chris has been a club member since he was about 8 years old and has been a regular in the Men’s 2nd team. He has also been supporting the coaching of our youth section. Over the years, Chris has made many friends at the club and we are all eager to help him and his parents Kath and Ian through this turbulent time in their lives. Rotherham Hockey Club is aware that Chris and his family will need a tremendous amount of support for them to deal with the after-effects of this tragic injury. 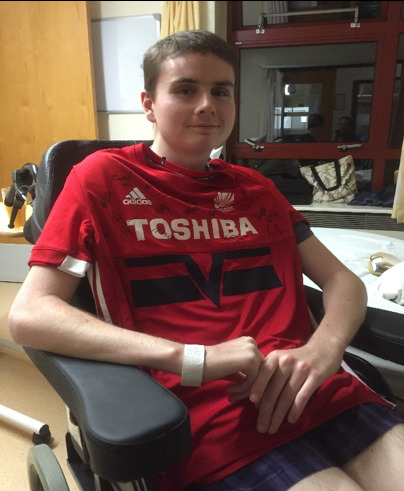 In offering support, the club has recently undertaken a “Sponsored Walk” to raise funds for Chris. At this time it is unknown how much money has been raised, but it looks like being a substantial sum. Other events, including a ”Hockeyathon” on 15th December along with a quiz/social night in the evening of the same day are planned. A special guest speaker; Gavin Featherstone, himself a former England international player, who turned to coaching and is recognised as one of the most travelled and respected international coaches, will be giving a special presentation at the home of Rotherham Hockey Club on Friday 30th November. 50% of all book sales is being very kindly donated by Gavin. Please support this event by booking your place asap. Social media, local press and radio will also be used to promote these events so please keep an eye and ear open for them. We would like to especially thank Barry Middleton; England and GB’s most capped player. Barry has been absolutely brilliant in his unstinting support; he has brought Chris’s plight to the attention of the GB/England squads whose willingness to become involved cannot be overstated. Andy Halliday, GB’s team manager, along with the likes of George Pinner and other squad members have very kindly supported our appeals. All of these individuals and others, are supplying signed items that we will be auctioning to raise additional funds for Chris and his family. We cannot thank them enough! In addition to this, Yorkshire Hockey Association President, Jon Bray (a former Rotherham player and a current Vice President) is contacting all the England Hockey Premier League Clubs to hopefully obtain signed National League shirts we can also auction to raise additional funds. Furthermore, offers of help and donations have been received from many supporters and players of hockey who themselves do not know Chris – their kindness and comforting words, has been overwhelming. This kind of effort and support simply highlights what a close-knit community the hockey world is. Rotherham Hockey Club and I in particular, cannot express how grateful we are. A simple thank you does not suffice, but it’s all we have. A Just Giving website has been set up if anyone who wishes to contribute to the fund.